Where in the world are Judy and John????? As we left our intrepid voyagers they were in Santa Fe contemplating where to go to next. It was on to Cimarron, New Mexico where else? 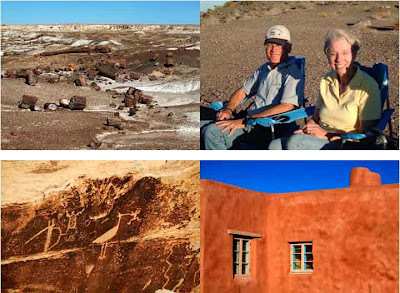 We have always wanted to visit Taos and the “enchanted circle”. After discussing the route with locals it was decided that we should go east and then north to avoid some difficult roads. That wasn't true but more about that later. So on Monday morning we headed out of Santa Fe. We arrived in the sleepy little town of Cimarron 4 hours later. We checked into the Cimarron Inn and RV park. We were the only ones staying in the campground and as it turned out we had no cell phone service or internet connection. We fixed ourselves a quick lunch and then hopped in the jeep to check out the small town. Also known as the home of Philmont Scout Ranch. 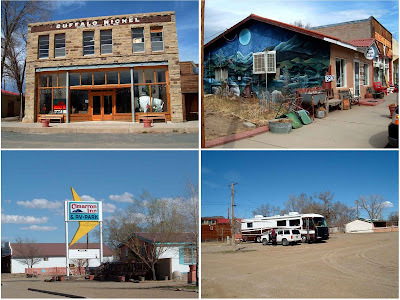 Cimarron is an old western town with lots of history, and it was authentic. By that we mean no gimmicks, just nice people struggling to make a living. We think we were among the very few 'non-locals' who visited the little shops that day. We had fun and just relaxed. Tuesday morning we headed up Cimarron Canyon to hook up with the 'enchanted circle'. This is a road that goes through several small towns and offers spectacular views as it circles around the highest mountain in New Mexico. Mt. Wheeler is actually on the southern end of the Rocky Mountain range and is over 14 thousand feet high. Our circle started as we headed north out of Eagle Nest. We went over Bobcat pass and dropped down into the town of Red River. We visited a store that was selling animal wood carvings to look for a bear. We didn't see anything we wanted to buy but enjoyed the stop. In the town of Questa the circle turned south and we soon found the terrain to be between high desert and mountain. We went through several small towns and it was easy to see the difference in the economy. If the town had skiing available, like Red River, the economy was doing well. If it didn't have anything to draw tourists, it was barely surviving. We then took a brief detour to the west to view the Rio Grande gorge. It's hard to explain, but we were driving across the desert and suddenly a giant slit in the ground appeared. It's a 800 foot deep gorge with a bridge across it. We have never seen anything like it. This shows the gorge from the middle of the bridge. When you are standing out on the bridge it shakes up and down every time a truck goes across. Not exactly reassuring. It was time for lunch so we headed south to Taos. It was warm outside so we found a little cafe and sat outside to eat. When we were done with lunch we visited a few galleries and then found a coffee shop with some great local coffee. Before leaving Taos we visited the St. Francis of Assisi Church. 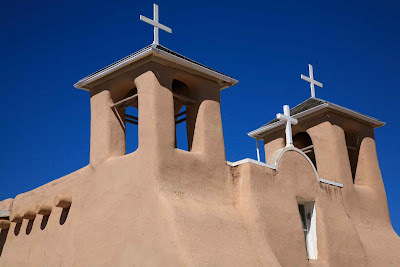 After being at the Basilica of St. Francis of Assisi in Assisi, Italy it was only fitting to visit St. Francis of Assisi church in Rancho de Taos. 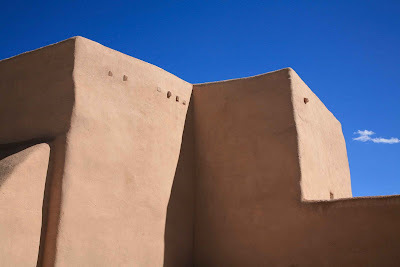 Built between 1772 and 1816 it is uniquely southwestern. This church has been painted and photographed by artists such as Georgia O'Keefe and Ansel Adams. So it seemed only fitting that we should photograph it!!! We then headed east back over the Palo Flechado pass, past the ski resort town of Angle Fire and completed the circle in Eagle Nest. We headed back down the Cimmaron canyon and called it a day. It turns out we could have taken our rolling home from Santa Fe directly up to Taos. The roads aren't any worse than some others we have traveled on. So we will consider this our scouting trip. We'll be back. D. H. Lawrence is quoted as saying “Taos is not a place, it's a state of mind”. Who are we to disagree. After our day at the Petrified Forest National Park with Bob and Linda it was time to move on. Our next stop was Santa Fe. This is my third visit and Judy's second. Santa Fe sits in a valley with mountains to the north and east. 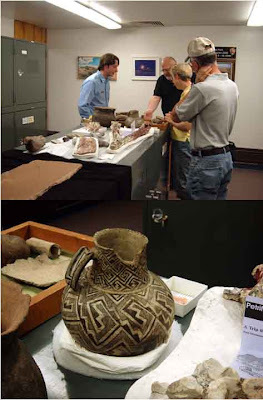 It is the capital of New Mexico and a neat mixture of art and southwest. Saturday morning we headed to the downtown plaza. After some window shopping and admiring the turquoise jewelry, it was time for lunch. On our last visit we had eaten at the Blue Corn Cafe and really enjoyed it, so we headed there again. Bad choice. So So food, loud loud music, and indifferent staff. Frankly we couldn't wait to leave. After a little more window shopping we stopped in at the Chili store. We bought a couple of things and then hit up one of the people who worked in the store for a few dining suggestions. When we told her where we had just eaten lunch she rolled her eyes. Same reaction for the famous Coyote Cafe across the street. She did however give us 3 or 4 recommendations. Our last stop of the day found us at the Photo Eye Gallery and bookstore. This is a favorite place of mine. The gallery had a show by Nick Brandt on display. These are large pictures of African wild animals, but done as fine art. Hard to explain but incredible to see. Unfortunately the prices are a little out of our range. If you would like to see some of the images go to www.photoeye.com/nickbrandt. When we go out for lunch, we always eat in for supper. We had leftover white chicken chili and a piece of Bob's Red Mill Irish soda bread that Judy had made in honor of St. Patrick's Day. After such a disappointing lunch on yesterday, today we decided to skip breakfast and go out for lunch at Maria's. This was one of the restaurants recommended by the lady at the Chili shop. It turns out we had eaten there a few years ago on our last visit to Santa Fe. We were not disappointed. Yes, we try to eat low fat, low carb most of the time, but now and then we indulge. As you can see from the picture, I indulged. One of my weaknesses is really good tamales. I wasn't disappointed. Maria's was as good as we remember it from our last visit. Of course what do you expect from a restaurant that has over 100 varieties of real margaritas on the menu. In their words. “No mix, sugar, or additives in our Margaritas. We use only REAL tequila, REAL triple-sec, REAL fresh squeezed lemon juice and ice made with filtered water”. There's even one called “The Randall Scandal”. No, Judy and I did not misbehave, it's named after a Santa Fe resident named Randy Randall. After we finished our lunch and waddled back to the car it was time for a little culture. We drove over to the Georgia O'Keeffe museum. O'Keeffe has been a major figure in American art since the 20's. She is chiefly known for abstraction and representation in paintings of flowers, rocks, shells, and landscapes. Her paintings have crisp contoured forms with subtle transitions of color and she often transformed her subject matter into powerful abstract forms. She was married to the internationally known photographer Alfred Stieglitz. Her work was first shown in 1916 at Stieglitz's avant-garde gallery, 291 in NYC. After Stieglitz died she move west permanently and lived north of Santa Fe at Ghost Ranch. That there is a museum in this town devoted solely to her work speaks volumes. After watching a great documentary on her life and viewing her work we wandered back down to the plaza. What a beautiful day. Native Americans selling jewelry and people just hanging out enjoying the warm weather. We certainly have enjoyed our stay here. This is a beautiful area and with regret it's time to move on. We hope your day was a good one, and to our friends in Michigan. Spring is coming, Soon, Soon. P.S. About the Blue Bunny ice cream. We have been on a quest to find some Sugar Free Blue Bunny ice cream. Finally, today we had success. So after a light dinner of scrambled eggs, dessert tonight was a sugar free cookie, and some bunny track ice cream. It's been almost a week since we updated the blog. I know the millions of our faithful readers must be wondering what we have been up to since Bisbee. Did we get overrun by the undocumented workers, did we fall in the Lavender Pit mine, did we go home to Michigan to enjoy the spring thaw. Well stay tuned and we will answer these questions and more. Tuesday morning we left Naco and headed north. We crossed I-10 and stuck to the 2 lane roads. We were going to stay in Globe but arrived there by 1:00 pm so decided to push on north. After an hour of climbing mountains the terrain changed and we soon dropped into the Salt River canyon. The only way I can describe it is a miniature Grand Canyon. We carefully worked our way down the switchbacks across the river and up the other side. Sorry no pictures. Another hour found us in Show Low Arizona. What a contrast. We were now at 6,000 feet but what a change in scenery. Instead of the mountains and pines we entered the Colorado Plateau. Flat, yes, really flat. 40 miles further north found us in Holbrook. Holbrook is a neat little town in a funky rundown sort of way. Lots of Route 66 stuff. Hopefully the pictures help tell the story. Wednesday we went exploring and just relaxed. We had something special planned for Thursday, but I won't give away the surprise just yet. Even though we are at a high altitude, it is sunny and mid 70's during the day but gets down to a chilly 35 at night. I'm sure all you people in Michigan feel sorry for us. We are staying at a neat little campground near Holbrook, Arizona called Root 66 RV Park, (yes I know about the spelling but check the picture), run by a Native American family. Complete with chickens and petrified wood sales. It is right on the original Route 66 road and there are the remains of an old motel on the campground. More later. Hope your day was a good one. We are doing our part to protect the border. We are currently in Naco, Arizona. We are literally 300 yards from the U.S. Mexico border. We even arrived here early in the day. Saturday's visit to Tombstone was less than inspiring. So Saturday night we carefully reset all 6 clocks in the motor home an hour ahead. You all remember, daylight savings time. We got up Sunday morning so proud of ourselves, and got the motor home ready to leave. Check out time was 11:00 and we didn't want to overstay our welcome. This was a nice resort, but more rules than necessary. Oh, by the way, I forgot to mention there are 2 states in our wonderful country that don't recognize Daylight Savings Time. We just happen to be in one of them. After a short but beautiful drive down through the town of Sierra Vista and along the Huachuca Mountains we pulled into the Turquoise Valley Golf and RV resort in Naco. Not really a resort, but they claim if you are Tiger Woods you can hit a ball into Mexico.If you look carefully in the picture of the park we are staying in you can see the Mexican flag. The border is that close. If we are overrun, we'll call for help. We figure we can barter some of the extra wine we have on board. I'm sure Chris and Teresa back in Michigan wouldn't mind contributing a few of their cases to better U.S. and Mexico relations. So what brings us to Naco. Well it isn't the golf, and although the weather is perfect, (mid 70's and blue skies) we are here to visit the town of Bisbee. Bisbee is a mining town which was settled in 1880 in the Mule Mountains. The town is literally built in the canyons. The mines here have produced nearly 3 million ounces of gold, and more than 8 billion pounds of copper, not to mention the silver, lead and zinc that came out as well. In the early 1900's Bisbee was the largest city between St. Louis and San Francisco. But as with most things, the mines played out and the town population shrank. The last mine closed in 1975. Bisbee might have ended up as a ghost town but in the 70's the town was revitalized by hippies ready to settle down and artists seeking inspiration. And the retirement community discovered it's wonderful climate. 8 months of the year it's in the 70's,. 2 months of 80's, and 2 months of 60's. Bisbee is a town to run away to. We must admit we are enjoying our stay here. As you can see in the pictures there is still a little of the hippie influence here as well as wonderful small diners and great Mexican food. On the outskirts of town is the Shady Dell Park, an old fashioned trailer park with restored airstream trailers that you can rent by the day. There is also an old fashioned diner there to complete the experience. Many of the old Victorian and European style homes in Bisbee have been restored. But not to perfection. Instead they have let them age gracefully. Kinda like Judy and Me. Yesterday we met a young man who has a coffee roasting business. He was as passionate about coffee as the wine makers are in California. We ended up buying some freshly roasted coffee and it is great. He runs his business over the Internet and ships all over the United States. Kind of like Pro Lab Express, only with coffee. If you would like to go to his website it is www.Uniquecoffee.com, and if you have questions email Seth at Seth@uniquecoffee.com. This young man was so passionate about his business. He ended our conversation by telling us and I quote “I want to be your personal coffee roaster.” Now how many people do you know who have their own personal coffee roaster? He's got my business. His prices are very competitive and the quality was outstanding. He also makes some chocolates, and in one of them there were dried cherries. He gets the cherries from Traverse City, Michigan.. It sure is a small world out there. One other thing has really made an impression on Judy and me. The people on the street and the merchants in town have all been so friendly. In a truly genuine way. We can't wait to come back here again. Tomorrow we head up to Northern Arizona. We hope you feel as blessed today as we do. Oh, by the way, our youngest granddaughter Mia had her first birthday on Sunday. We wish we could have been there but our thoughts certainly were. Happy Birthday Mia!!! It was 10:30am and already warm outside when we pulled out of our campsite at Picacho Peak State Park. After only a short drive of 90 miles we arrived in Benson, Arizona. Having noticed ,earlier in our trip, a billboard advertising a rv/truck wash at the Benson exit, we decided it was time to wash the road grime off the rv. This turned out to be a very nice, reasonably priced, self serve wash. If only we had this type of facility back in the Midwest. Washing the rv is a dirty, messy job but needs to be done every once in a while. With the rv clean and shiny once again, we made the short trip down the road to the Cochise Terrace RV Park, which was to be our home base for the next couple of days. Saturday morning we were off to Tombstone. The town of Tombstone is about 35 miles from Benson and visiting this town was one of the reasons for stopping here. We had been warned that Tombstone is very touristy and as we were to find out that is very much a true statement. It seems very one dimensional and seems to be trying way too hard ...... If you are expecting to see a slice of the old west this isn't it. We lost interest very quickly and after about an hour decided we'd had enough. The Boothill Cemetery just outside of town was the most interesting. ........ Reading the markers makes you realize how swift justice could be. Although I'm sure George wishes it were a little less swift and a little more accurate. One of the highlights of the day was exploring the back roads out in the desert after we left Tombstone. We headed west out of town by way of a dirt road through the town of Gleeson, then headed north on Ghost town Trail Rd. up to the little town of Pierce where we stopped at a small pottery shop. We bought a little milk pitcher which was nice, but mostly because we felt sorry for the shop owner. As this desert town is out in the middle of nowhere, ours may have been her only sale of the day. Back through Benson, a quick stop at the Safeway and our day was complete. Monday morning was our time to leave Paso Robles. We have enjoyed this area, but it's either time to find a job here or time to move on. And since we have a business back in Michigan, it's time to move on. We decided to avoid the traffic of Los Angeles on our way out of California. So we headed east for the first time in 6 weeks and began crossing over the mountains towards Bakersfield. The landscape began to change as we went up over a 2nd range and into the Mojave desert. So far, so good. We stopped at a rest area near Edwards Air Force Base for lunch. Turns out this is the area where the famous 20 mule team wagons brought borax out of death valley. An hour later found us in Barstow where we joined up with I-40 heading east. We really enjoyed the drive and will remember this route for future trips out to the California coast. We stopped for the night at the Desert View RV park on historic Rt 66 in Needles Ca. It was a pleasant 65 degrees outside. The last time we were through here was with our kids back in 1993 on one of our famous road trips. It was slightly warmer then. Judy reminded me that the temperature back then was 120 degrees. The next morning we did a quick load of laundry and took our time leaving since we knew we only had a couple hour drive to Lake Havasu City. Our plan was to stay for a couple of days at the Cattail Cove State Park in Lake Havasu and to see the famous London Bridge. Well, Arizona State Parks do not take reservations. When we arrived there the campground was full, but they offered to let us park overnight in the overflow parking lot (for $14) and to put us on a waiting list for a camp site for the next morning. We paid the $14, parked the RV, unhooked the car, made a joint decision that we were going to leave this area in the morning, and headed into Lake Havasu to check out the bridge. The picture of the bus sums up my feelings about Lake Havasu. It looks like a city built with no plan and certainly no heart. And the British shops surrounding the bridge. All closed. There were 2 t-shirt shops trying to stay in business, and one poor guy on a P.A. system trying to convince people to go on a boat ride. After 15 minutes we left. While we were out we found a little mexican restaurant for lunch called Mad Miguel's. Really good food. So far that was the highlight of Lake Havasu. It was 85 degrees outside when we got back to the rv so we needed to turn on the generator and AC to cool down the inside of the RV. Later in the afternoon , when it had cooled down a little, we went for a walk on a trail along the lake. It was so quiet and peaceful. It made the day. We continued south to Quartzite. It seemed strangely familiar to be back where we started our Western adventure almost two months ago. The town is much quieter now that the shows are done and people have moved on. While I filled up the RV with propane and diesel , Judy ran in and made a quick purchase at the bead shop next door and mailed a couple of letters. We continued driving east and by 3:00 p.m. we found we were close to Picacho Peak State Park (about 45 miles north of Tucson). After calling ahead and finding that they had sites available we decided we had driven far enough. This is a very nice park and we found a large pull-through site with electric hook-up. By 4pm we were sitting in our chairs, having our peanuts and beverages, and thinking we might have to stay here more than one night. We fixed salmon patties and salad for supper and then watched the sun go down over the mountains. It was a classic sunset. I don't know if the pictures do it justice. Another day of safe travels. Another good day. We wish the same for all of you. Even though we weren't feeling 100 per cent today,we decided to drive down to Los Olivos and meet up with our friends from Michigan. Judy fixed our morning meal of oatmeal, adding some flax seed for good measure. We were on the road by 8:30 and after a wonderful drive down the central coast we arrived in Los Olivos just before 10am. 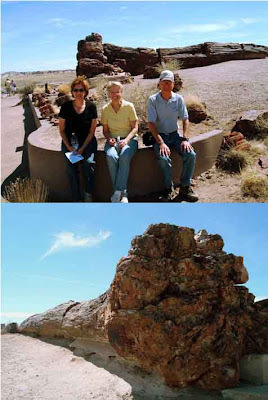 We met Chris and Teresa and their daughter Audrey at their hotel and then drove a short distance up one of the canyons. Within a short 5 mile span are some of our favorite wineries. Firestone, Curtis, Fess Parker, Koehler and Zaca Mesa to name a few. We decided to start at the upper end at Zaca Mesa Winery. We visited here last year and really enjoyed our visit, not to mention the wines. One nice thing about going during the week is there are no crowds. The young man who poured for us was great. It turns out this is his part time job. His full time job is owning and running a cheese shop with his wife in nearby Solvang. Unfortunately, time did not permit us to visit his cheese shop but we definitely want to the next time we're out here. Due to changes in the law, some wineries are finally shipping directly to Michigan. We took advantage of this by joining their wine club. We'll get 4 shipments a year at very attractive prices. And these are wines you would never find in Michigan. As we were finishing with the paperwork ,our wine guide mentioned that they were bottling wine that day and we were welcome to watch. What a surprise. It turns out that smaller winery's like Zaca Mesa don't have their own bottling facilities but contract it out. We thought that meant that they shipped the wine somewhere else to be bottled. Instead, the bottler comes to them. We walked out back and saw there was a semi tractor and trailer parked there. Inside the trailer was a full bottling line capable of bottling 55 bottles per minute. It turns out “The Bottle Meister” mobile wine bottling of San Luis Obispo owns 2 rigs, each costing 1 million dollars and they travel from vineyard to vineyard. They had been set up at Zaca Mesa all week and were going to be finishing up on Friday. What amazed us is that they welcomed us up into the truck to watch the production. We have never met more friendly guys who seemed so proud of their work. The bottling company provides 2 men and the vineyard supplies 6 other workers to keep everything running smoothly. As you can see in the pictures this is a highly automated process. Nitrogen is used to purge all the air out of the bottles and the bottles can be sealed with a natural cork, synthetic cork, or screw caps. The line then applies labels and then the bottles are returned to cases. A case of wine is 12 bottles which or roughly 2.4 gallons. Over the course of year Zaca will sell approximately 35,000 cases or 84,000 gallons of premium wine. And this is considered a small winery. This was a rare experience that we just happened to stumble upon and what makes this trip so special. We then went back down the road to the Fess Parker Winery. If you are my age you might remember him as Daniel Boone,on the tv show by the same name, who traveled with his trusty companion Mingo, played by Ed Ames. Ed Ames' role as Mingo led to an infamous tomahawk throwing demonstration on the Tonight Show with Johnny Carson. You know, the guy that hosted before Jay Leno!!! What many people don't know is that Fess and his family live in this area and have a wonderful winery and hotel in Los Olivos. Once again we were able to sample some new wines that aren't even on the market yet. If I look rather loopy modeling the coonskin cap it was my cold not the wine. I promise!!!! While I didn't buy the cap, Judy did talk me into buying a cheese board. Fess Parker also produces a wonderful fig balsamic vinegar that we like a lot. We bought several bottles of that along with a new balsamic vinegar containing black cherry. If you saw the movie 'Sideways', some of the tasting room scenes were filmed at the Fess Parker Winery. It was now time for lunch so we drove back into Los Olivos for lunch at the Los Olivos Cafe (also shown in the movie 'Sideways'). We shared a small pizza and some great bulghar vegetable soup. Simple food, prepared well, with excellent service. After lunch, we then drove over to the Lincourt Winery. The tasting room there is in an old farm house. Sitting out on the porch looking over the valley a certain peace swelled over me. Like my good friend and business partner Stan says: “This is how man was meant to live”. Unfortunately, in this area, living this way requires a lot of money. That's one of the advantages of traveling by RV. We get to taste the local culture without all the baggage, or in this case mortgage and taxes. One thing I have discovered on this trip. When you get away from the big cities, even in the blue states of Oregon or California, the people are pretty conservative, just like in the Midwest. But I digress. Once again we were the only ones in the tasting room and a retired school teacher was doing the pouring. Judy was surprised to see her knitting a scarf as we entered. After discussing knitting, log cabins, chamberpots and wine, it was time for us to move on. Lincourt produces some excellent wines and we were tempted to join their wine club. But frankly, I think we have already spent our wine allotment. We did leave with a bottle of young wine which we are going to hold onto for a few years. Our last stop of the day was at Koehler Winery. I must confess that I wasn't really into it at this point. My cold had reasserted itself and I found myself dreading the 90 minute drive home. It is a beautiful winery, but I was so congested that I really couldn't taste anything. The highlight for me was seeing their herd of emu's. We said goodbye to our friends and headed back up to Paso Robles. So even though we weren't feeling well we're glad we made the trip. Beautiful Scenery, Good Food, and Good Wine. Yes Stan, “This is how man was meant to live”.